We went horseback riding in the dark. That’s not exactly true. There was moonlight and lights from the barn, but it was near midnight and we were sixteen. My friends, J and M, sisters, owned horses, and once in a while we were allowed to go riding at night. We would leave the saddles behind and hold on to their manes, leaning in close and letting them run. We weren’t supposed to let the horses run because we couldn’t really control them without reins and bits, but we couldn’t resist. It scared me half to death every time. 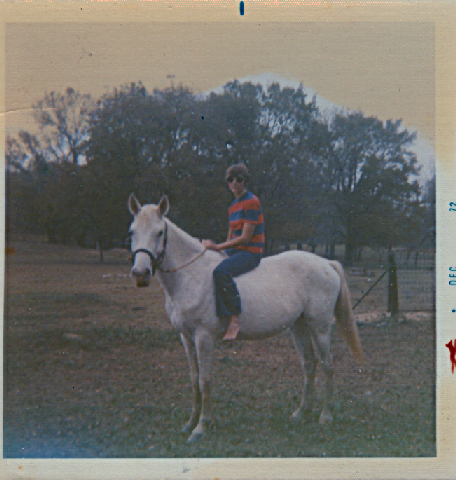 Eventually, of course, we graduated from high school and left for college, but that first Christmas vacation home, we met at the barn for one more moonlight ride. J and M’s parents were going to sell the horses. After our last canter across the field, we stood in the stables and wondered what to do next. Our hometown closed early, we didn’t want to go home to our parents, and we had no boyfriends to distract us. Not as romantic as horses, but something to do. The woods weren’t much of anything–pine trees and palmettos and tall grass–the woods stretched between the stables and the country club. J. drove, and we headed down the dirt road, around the fence, across a bumpy, dry field, and into the trees. A few minutes in we heard an engine. Then we saw headlights breaking through the trees. An large vehicle with a strip of lights across the roof was coming up behind us. J. pressed on the gas and tried to make the golf cart go faster. We had the advantage of being able to fit between the trees, though we almost got stuck on a bush we ran over. We said all the things you’d expect–oh my god, get out of here, and who the hell are they? And J., go faster! We got out from the trees, hunched forward as if this could make a golf cart go faster. The truck was stuck at the treeline, revving its engine. M. said breathlessly, “I saw something on the side of the truck.” I crashed into J. as she took the turn through the fence. “What?” I said, pulling myself back up. The truck was now barreling over the field, catching up. “Five points?” I asked. We flew out of the ditch, across the road, and pitched ourselves over the wooden fence into the field where we’d been riding the horses. The truck was coming up the dirt road. No lights hit the field and we ran in darkness, towards the barn. The truck headed towards the barn too. Before we reached the next fence, we threw ourselves flat on the ground. Cramps pulled at my side. We heard the truck stop in the gravel. The doors opened. As long as no one thought to shine a light over to our bit of grass, we would stay hidden. M. risked looking up. “It’s the police,” she whispered. J. squished her face into the grass to keep from laughing. A circle with five points indeed. Sometimes you think you’re being chased by murderers when really you’re being run down by country club security who thinks you’ve stolen a golf cart. If you’re lucky, a stablehand says he doesn’t know anything about any girls, but he thinks he saw some people running in the other direction. Sometimes you think you’re writing one kind of story, but you look back and find it is something else entirely. The signs were there, but you weren’t looking at them the right way. If you want others to pay attention to all the work you’ve done, you can’t just roll in the grass giggling under the stars. Or you could, I suppose, but somewhere along the line you’ve got figure what kind of story you’ve got. This is my problem. I still in the field, staring up at the night sky, pleased and wondering if I’m going to get into trouble. I don’t know if I’ve got a novel or a bunch of words with some points sticking out. If you’re pleased, you just might have the novel. And now you know how it feels. Marta- I’m curious- do you start with an image- a photograph- and then write about what it evokes? Or do you have a topic first, then look for an image or photo that represents or illustrates what it is you want to say? I’m curious, because the link between my visual awareness isn’t very strong, and I’ve been thinking about how to move deeper into a relationship wtih images, if that makes sense? Sometimes one way and sometimes the other. Most often I start with the memory, then the photo comes to mind and I have to dig for the photo. I think then of the writing connection, but many times that connection changes by the time I get to the end of the post. When I’m looking for a particular photo, I pull other images that interest me and I hope that eventually I’ll think of something to go with it. Sometimes I get frustrated because I either can’t find the picture I have in mind or the image I want doesn’t exist. Usually my stories/novels start with an image in my head–no plot or specific character, just an image. Like the first novel started with the image of a girl spilling marbles on a wooden staircase. I write to find out more. That was a nice question. Thank you for asking–I hope this answers it. I think what your novel needs is for you to lie in the grass a little and stare up at the stars, maybe next time you look back at the words, they will have resolved themselves into the sign that you are looking to understand. Love the image of lying on your back under the night sky — or, for that matter, burying your face in the grass to keep from laughing at how ridiculous the whole thing seems to be turning out. Actually this might not be a bad thing, as long as you turn your head every now and then to see what’s going on around you. The stars (and the grass smashed up against your face) tend to be awfully… static, no? I am very detached from old photographs of me- she seems like a stranger- but I’m working on that.